Which Marketing Framework is Right for You? Your marketing framework is a visual representation of how marketing gets done in your business, highlighting a logical flow in which all the various components making up your insights, strategy, plan, tactical execution and measures work together to bring that vision to reality. There are numerous templates available, covering “optimal” marketing deliverables of all shapes and sizes. So, which marketing framework is right for you? Is there a one-size-fits-all silver bullet? A one-size-fits-all approach to choosing a marketing framework is dangerous for several reasons. Every business is different, with a different set of needs that the marketing framework has to fill. “Picking your battles” is a key principle involved in any marketing excellence program, so the perfect marketing framework needs to reflect the 2-3 most important capabilities and competencies you’ve chosen to work on. The broader the framework, the more expensive it is to implement and the more change management is required to implement it successfully. Because of the many variables that affect the marketing framework’s components and successful implementation, it’s unwise to try to shoehorn a specific template onto any organization. However, there are some basic framework types that you should review to determine how to create your own unique optimal framework. How to choose the right framework for your unique needs. Defining these factors in your own business case is a vital first step to analyzing the various framework options and choosing the one that is best for your unique business requirements. In many cases, it takes the objective insight of a third party to effectively tackle this analysis. Once these factors are fully defined, you’re in position to review the four main marketing framework templates below with an eye for which one best suits your needs and how it can be optimized for your business. New Solutions Go-to-market – This option is best for businesses in a rapidly evolving industry where success is driven by innovation and the ability to rapidly bring relevant and unique solutions to market. It will help build an industry-leading product pipeline that delivers unique value to target customers while driving competitiveness and growth. 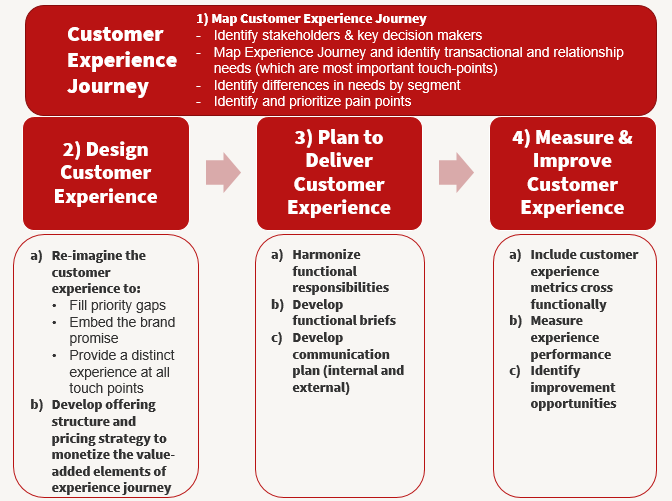 Customer Experience – This option stands out in service-oriented businesses where the opportunity to differentiate through product is limited. The framework allows marketing to differentiate, not just through products, but through consistent, best-in-class experience at critical touch points. 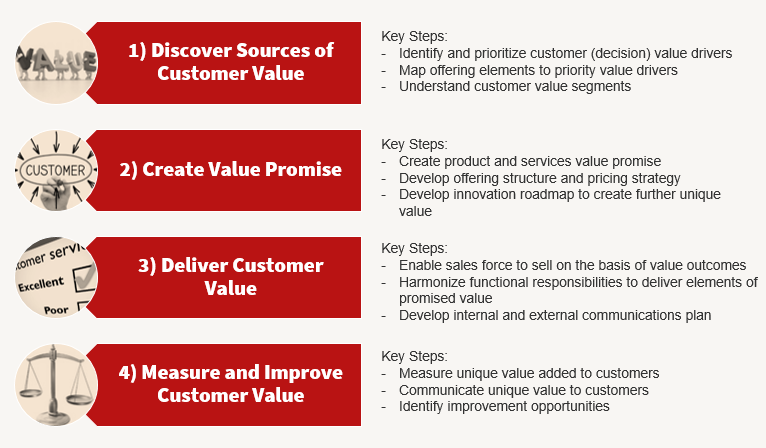 Customer Value Management – This option is tailor made for businesses facing commoditization and margin compression. It is designed to measure, price, sell, and communicate higher value for the customers to allow the business to realize higher margins. 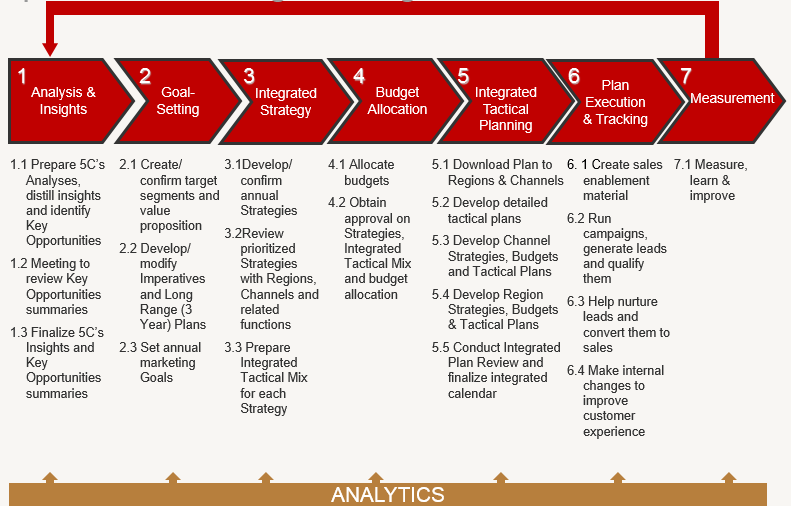 Marketing Planning – For slow-growth businesses with a global matrix organization that finds it hard to rapidly address growth opportunities, the Marketing Planning framework allows them to develop market-back strategies that target growth opportunities and create a strong plan to address them. Again, none of these generalized frameworks are going to work out-of-the-box to address every unique need your specific company has. If it does, it probably means you haven’t taken enough time to analyze the situation completely. But they do offer a solid foundation on which to build a marketing framework that is perfectly suited to your unique business needs. If you can use help determining which framework is best for you and fitting it to your unique needs, contact us and we’ll be happy to help.